In October 2012, a one-day online symposium created a platform for discussing the practice of cyberformance—live performance that uses internet technologies to connect remote participants. The 12-hour event featured 10 presentations and attracted an audience of over 100 from around the world who engaged in a lively, vibrant conversation. 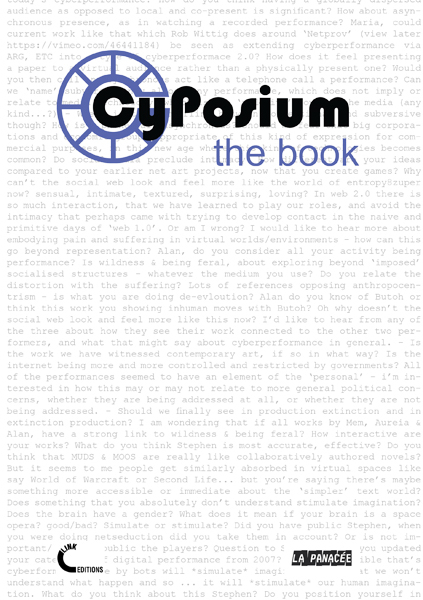 CyPosium – The Book presents a selection of artefacts from the CyPosium – presentation texts, chat log excerpts, discussion transcripts, edited email conversations, creative chat excerpt essays and illustrations – along with invited articles that respond to the event. The contributors hail from a wide range of artistic practice both online and offline, and their writing illustrates the hybridity of contemporary arts involving digital technologies.